Today's venue is Qualia on Hamilton Island in the Whitsundays. Qualia (pronounced kwah-lee-ah) in Latin means "a collection of deeper sensory experiences". Qualia is situated on the secluded northern-most tip of Hamilton Island surrounded by all the splendour of the Great Barrier Reef. Its distinctive style and unmatched location, makes it a luxurious resort of world-class standard. Every detail has been meticulously considered to relax the mind and spoil the senses. On arrival, VIP transport is provided to transfer you to qualia. A VIP chauffeur service is provided for around-island transport, and you have the use of a two-seater electric golf buggy for independent excursions around qualia and Hamilton Island (the main method of travel around Hamilton Island - residents and guests of all the island's hotels utilise these buggys - you won't find many cars on Hamilton Island. Luxury Resort Facilities qualia’s private guest-only facilities provide the ultimate relaxation of two swimming pools, soothing treatments and yoga at Spa qualia, a choice of casual and formal fine dining at two private restaurants, a fully-equipped gym, and a tranquil library. One of a group of 74 islands in the Whitsundays, Hamilton Island is located a little south of Whitsunday Island, a short flight from Sydney or Brisbane. It is the only island within the Whitsunday group to have its own commercial jet airport and receives direct flights from Sydney, Melbourne, Brisbane and Cairns. 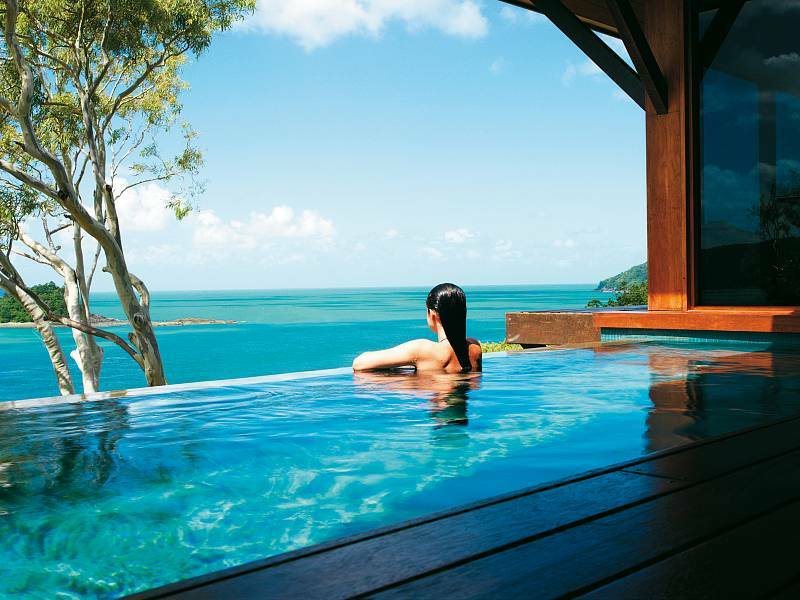 Fringed by coral reef (including the incredible Great Barrier Reef), white sand beaches like Whitehaven Beach and secluded inlets, Hamilton Island is a haven of relaxation and luxury. Waterfront Marina Village is the main gathering place for guests and residents alike and offers a variety of restaurants, shops and bars as well as serving as the main departure point for ferries over to Dent Island, Whitehaven Beach and to Hamilton Island Golf Club. Enjoy a cocktail on the deck of the Hamilton Island Yacht Club or explore the many restaurants the island has to offer. With a variety of hotels and dedicated dining areas around the island, you have a wide variety of dining choices at your disposal. Coca Chu offers a delightful fusion menu to tantalise the senses, look at Manta Ray or Sails for a high-end meal or Bommie for a more relaxed setting. Take a ferry over to Hamilton Island Golf Club and enjoy a special lunch in the clubhouse or avail yourself of the many hotel eateries around the island or at your own door, in Qualia. Scuba Diving and other water sports are available as well as special excursions to scuba dive the Great Barrier Reef. Take a ferry to Whitehaven Beach or take a scenic flight there. The folks at Qualia can even arrange a private helicopter ride with a gourmet picnic lunch. Designed by five-time British Open winner, Peter Thomson, Hamilton Island hosts the only championship islang golf course in Australia and is open to guest players, just a quick jaunt by ferry from Waterfront Marina. As well as being a respite from the hustle and bustle of busy Australian cities, Hamilton Island is a beautiful and serene scene to immerse yourselves in. The perfect getway for couples, offering many romantic activities and dining experiences. Make Qualia your home away from home for your honeymoon and truly experience your newlywed bliss in a scene that is the epitome of bliss itself.